Baby Pac-Man ranks among one of the most bizarre arcade creations in video game history. It is one of only three video game/pinball hybrids ever produced (Baby is the first of two made by Bally Midway). This Pac-Man game, the second of three made by Midway without Namco's approval, was inspired by the pinball machine that Bally produced, entitled Mr. & Mrs. Pac-Man. 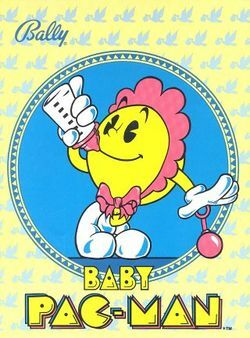 The last intermission of Ms. Pac-Man suggests that she and Pac-Man have a baby. Then a pinball game celebrates their marriage. Thus the game bearing the title Baby Pac-Man is a marriage between a video game and a pinball machine. But this marriage doesn't work very well. In Baby Pac-Man, you begin the game in a familiar scene; the center of a maze filled with dots and four differently colored ghosts. Two things are decidedly different this time. First, you'll notice there are no power pills. Second, in addition to the escape tunnels on either side of the screen, there are two escape tunnels that go down. In order to earn power pills, the player must direct Baby Pac-Man down one of the south-bound tunnels in order to enter... the pinball part of the game. A ball will launch from between the two flippers and you must keep the pinball in play long enough to earn power pills for Baby's consumption. In addition to the complicated play mechanics required to earn power pills, the pinball play field must also be used to increment the bonus fruit that Baby is presented with, since advancing the stage does not have any affect on the fruit, and it can also be used to increase the speed with which Baby Pac-Man can traverse the side escape tunnels. But the most frustrating aspect of the game by far is the complete disregard for the rules governing ghost movement that is established in the original Pac-Man games. The ghosts in Baby Pac-Man, have no distinguishing Artificial Intelligence, and they are entirely permitted to reverse their own direction at any time, leading to abysmally short maze durations for new players, even if they are expert Pac-Man players. Naturally, this unusual combination of video game and pinball made the game unsuitable for home conversion. However, in this day of emulation and sophisticated pinball simulation, the game can be played through a combination of programs known as Visual Pinball and PinMAME, the pinball equivalent to MAME. Baby Pac-Man suffers the fate of his parents and is trapped inside a maze with ghosts, where he must gobble up every dot to proceed to the next stage. But unlike his parents, he must earn his power pills by entering the pinball dimension and lighting up the targets that award him with this precious power up. This page was last edited on 15 November 2012, at 15:22.